Mike Lawler posted this on Twitter a couple weeks ago. That’s nice enough, and a careless solver would walk away (see later in this post). But you should always check your solution. If , then the longer base is and the two congruent sides are each 10. 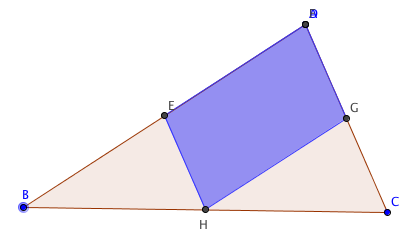 That appears to be OK until you add the two congruent sides to the shorter base: . Unfortunately, that’s the same length as the longer base, so this particular quadrilateral would have height=0. Alas, this problem, as initially defined, creates a degenerate quadrilateral, but you would know this only if you checked down a couple layers–something I suspect most students (and obviously some problem writers) would miss. Unless a class has explicitly addressed degenerate forms, I don’t think this is a fair question as written. Even so, I wondered if the problem could be saved. It wasn’t an isosceles quadrilateral in the formulation suggested by its unknown writer, but I wondered if there was a way to save it. My following attempts all keep the given side labels, but assume the figure is not drawn to scale. Some don’t realize that the definition of a trapezoid is not a 100% settled issue in mathematics. I posted on this almost three years ago (here) and got a few surprisingly fierce responses. The traditional camp holds to Euclid’s definition that a trapezoid is a quadrilateral with exactly one pair of parallel sides. I always found it interesting that this is the only quadrilateral Euclid restrictively defined in the Elements. The other camp defines a trapezoid as a quadrilateral with at least one pair of parallel sides. I’ve always liked this camp for two reasons. First, this inclusive definition is more consistent with all of the other inclusive quadrilateral definitions. Second, it allows greater connections between types. Much more importantly, the inclusive definitions create what I call a “cascade of properties.” That is, any properties held by any particular quadrilateral are automatically inherited by every quadrilateral in the direct line below it in the Quadrilateral Hierarchy. Under the inclusive definition, squares and rectangles are also isosceles quadrilaterals. I wondered if the quadrilateral could be a rectangle. If so, opposite sides would be equal, giving , or . That creates a rectangle with sides and 24. I was pleased to have “saved” the problem and quickly tweeted out this solution. Unfortunately, I forgot to double check the perimeter requirement of 88–a point someone had to point out on Twitter. I know better than to make unchecked public pronouncements. Alas. The given problem can’t be saved by treating it as a rectangle. Recovery attempt 2. Could this be a square? If so, all sides are equal and , but this doesn’t match the x-value found from the rectangle in the first recovery attempt. This is important because squares are rectangles. The given information doesn’t permit a square. That means the given information doesn’t permit any form of non-degenerate isosceles trapezoid. Disappointing. Attempt 3–Finally Recovered. What if this really was an isosceles trapezoid, but not as drawn? Nothing explicit stated in the problem prevents me from considering the and the unlabeled sides parallel, and the other two congruent as shown. So, as before with the rectangle, making the last labeled side. The sum of these three sides is , so the last side must be for the overall perimeter to be 88. The sum of the smallest of three of these is greater than the 4th, so the degenerate problem that scuttled Attempt #1 did not happen here. So, there is a solution, , that satisfies the problem as stated, but how many students would notice the first degenerate case, and then read the given figure as not to scale before finding this answer? This was a poorly written problem. In the end, the solution for x that I had posted to Twitter turned out to be correct … but not for the reasons I had initially claimed. Attempt 4–Generalizing. What if the problem was rephrased to make it an exploration of quadrilateral properties? Here’s a suggestion I think might make a dandy exploration project for students. Given the quadrilateral with three sides labeled as above, but not drawn to scale, and perimeter 88, what more specific types of quadrilateral could be represented by the figure? Rectangles and squares are already impossible. There is one convoluted isosceles trapezoid possibility detailed in Attempt 3. All four sides can’t be equal with the given information (Recovery attempt 2), so rhombus is eliminated. Recovery attempt 1 showed that opposite sides could be equal, but since they then do not meet the perimeter requirement, a parallelogram is gone. 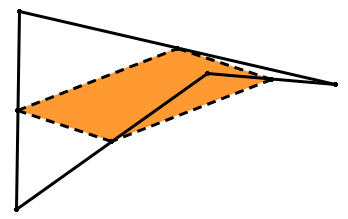 In a kite, there are two adjacent pairs of congruent sides. There are two ways this could happen: the unlabeled side could be 24, or it could be equal to . If the unlabeled is 24, then , an impossible result when plugged back into the given side expressions. If the unlabeled side is , then , making the unlabeled side 86 and the overall perimeter 220–much too large. The quadrilateral cannot be kite. In a quadrilateral, the sum of any three sides must be between half and all of the overall length of the perimeter. In this case, . Putting all three of these together, you can have a trapezoid OR a generic quadrilateral for any . The given information CAN define an isosceles trapezoid, but the route to and form of the solution is far more convoluted than I suspect the careless question writer intended. Sans the isosceles trapezoid requirement, this figure can define only a generic quadrilateral or a trapezoid, and only then for values of x where . Trying to make this problem work, despite its initial flaws, turned out to be a fun romp through a unit on quadrilateral classifications. Running through all of the possibilities, the properties of quadrilaterals, and narrowing down the outcomes might make this problem variation a worthwhile student project, albeit very challenging for many, I think. I just wish for the students the original problem hadn’t been so poorly written. But if that had happened, I would have missed out on some fun. Hopefully it will be worthwhile for some of your students. I didn’t encounter the Quadrilateral Midpoint Theorem (QMT) until I had been teaching a few years. Following is a minor variation on my approach to the QMT this year plus a fun way I leveraged the result to introduce similarity. 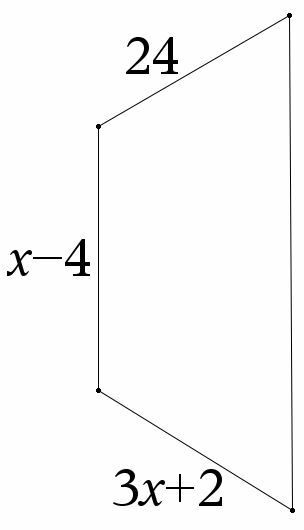 In case you haven’t heard of it, the surprisingly lovely QMT says that if you connect, in order, the midpoints of the four sides of a quadrilateral–any quadrilateral–even if the quadrilateral is concave or if its sides cross–the resulting figure will always be a parallelogram. 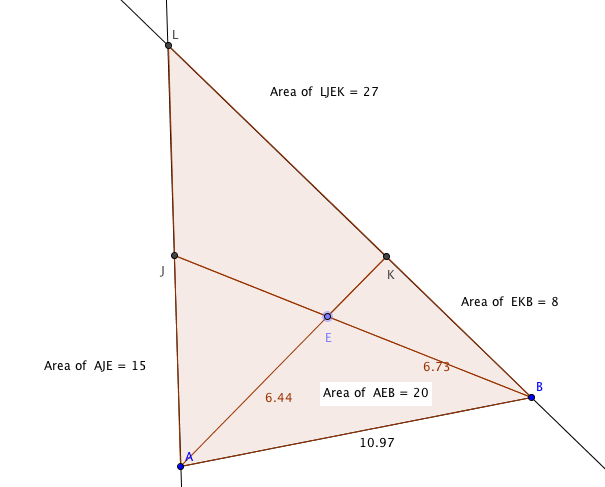 This is a cool and easy property to explore on any dynamic geometry software package (GeoGebra, TI-Nspire, Cabri, …). 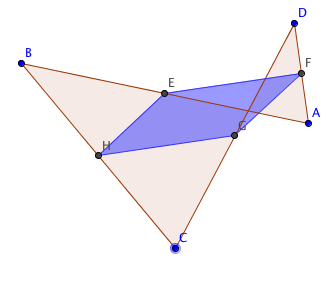 SKETCH OF THE TRADITIONAL PROOF: The proof is often established through triangle similarity: Whenever you connect the midpoints of two sides of a triangle, the resulting segment will be parallel to and half the length of the triangle’s third side. Draw either diagonal in the quadrilateral to create two triangles. Connecting the midpoints of the other two sides of each triangle creates two congruent parallel sides, so the quadrilateral connecting all four midpoints must be a parallelogram. NEW APPROACH THIS YEAR: I hadn’t yet led my class into similarity, but having just introduced coordinate proofs, I tried an approach I’d never used before. I assigned a coordinate proof of the QMT. I knew the traditional approach existed, but I wanted them to practice their new technique. From a lab in December, they already knew the result of the QMT, but they hadn’t proved it. 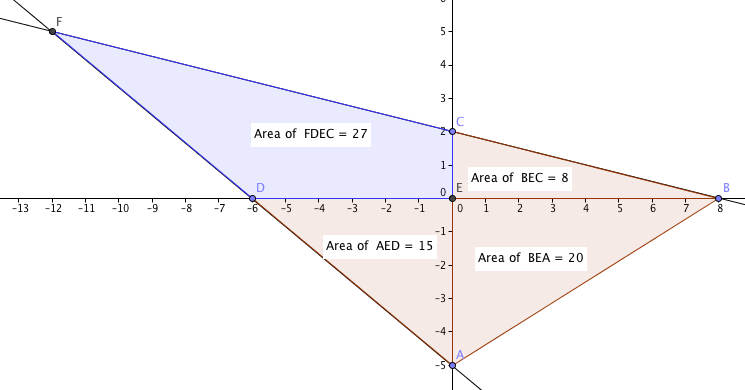 PART I: Let quadrilateral ABCD be defined by the points , A=(a,b), B=(c,d), C=(e,f), and D=(g,h). There are several ways to prove that the midpoints of ABCD are the vertices of a parallelogram. Provide one such coordinate proof. All groups quickly established the midpoints of the four sides: , , , and . From there, my students took three approaches to the final proof, each relying on a different sufficiency condition for parallelograms. The most common was to show that opposite sides were parallel. and , making those two midpoint segments parallel. Likewise, , proving the other opposite side pair also was parallel. 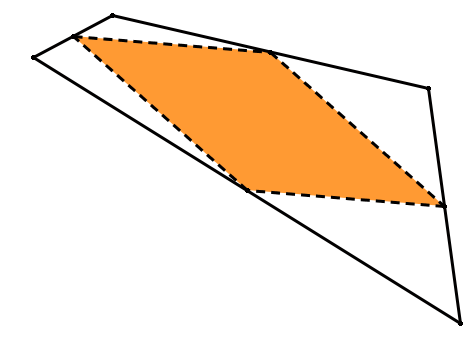 With both pairs of opposite sides parallel, the midpoint quadrilateral was necessarily a parallelogram. I had two groups leverage the fact that the diagonals of parallelograms were mutually bisecting. . QED. One student even proved that opposite sides were congruent. While it was not readily available for my students this year, I can imagine allowing CAS for these manipulations if I use this activity in the future. EXTENDING THE QMT TO SIMILARITY: For the next stage, I asked my students to explains what happens when the QMT is applied to degenerate quadrilaterals. 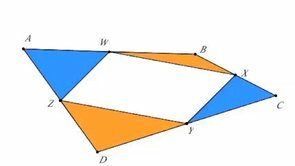 PART II: You could think of triangles as being degenerate quadrilaterals when two quadrilateral vertices coincide to make one side of the quadrilateral have side length 0. 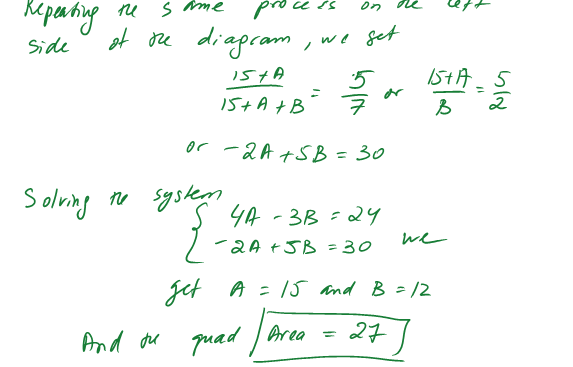 Apply this to generic quadrilateral ABCD from above where points A and D coincide to create triangle BCD. Use this to explain how the segment connecting the midpoints of any two sides of a triangle is related to the third side of the triangle. I encourage you to construct this using a dynamic geometry package, but here’s the result. Heres a brief video showing the quadrilateral going degenerate. Notice the parallelogram still exists and forms two midpoint segments on the triangle (degenerate quadrilateral). By parallelogram properties, each of these segments is parallel and congruent to the opposite side of the parallelogram, making them parallel to and half the length of the opposite side of the triangle. CONCLUSION: I think it critical to teach in a way that draws connections between ideas and units. This exercise made a lovely transition from quadrilaterals through coordinate proofs to the triangle midpoint theorem. I follow the Five Triangles ‘blog for cool math problems. A recent one proved particularly nice. At first I wasn’t sure this situation was invariant. I didn’t see how fixing three triangle areas guaranteed a fixed quadrilateral area. Not seeing an immediate general solution approach, I reasoned that if there was a solution, it worked for multiple overall configurations. If it worked in general, then it must also work for any particular case I chose, so I made the cevians perpendicular. That made each of the given area triangles right. I modeled that by constructing the overall triangle with the cevian intersection at the origin and the legs of the given area triangles along the coordinate axes. There are many ways to do this, but I reasoned that if there was a single answer, then any one of them would work. A right triangle with legs of length 8 and 5 would have area 20. Constructing that triangle in GeoGebra fixed the lengths of the legs of the other two triangles and the hypotenuses of the area 8 & 15 triangles intersected at a Quadrant II point. Here’s my construction. I overlayed a polygon to create the quadrilateral and measured its area directly. For fun, I also wrote algebraic equations for lines CB and DA, found the coordinates of point F by solving the 2×2 linear system, used that to derive the area of , and determined the area of the quadrilateral from that. While I realized that this approach was just a single case of the given problem, it absolutely convinced me that the solution was unique. Once the area 20 triangle was defined (whether or not the triangle was right), a side and the area of each of the other two given triangles is known. That meant the heights of the triangles would be determined and thereby the location of the quadrilateral’s fourth vertex. So, I knew without a doubt that the unknown area was , but I didn’t know a general solution. While I worked more on the problem, I also pitched it to my Twitter network and asked a colleague at my school, Tatiana Yudovina, if she was interested in the problem. Next is Tatiana’s initial solution, followed by my generic Geogebra construction, and a much shorter solution Tatiana created. My conclusion takes the problem to a more generic state and raises some potential extensions. Leveraging the fact that triangles with the same base have equivalent height and area ratios, she created a system of equations that solved to eventually determine the quadrilateral’s area. While Tatiana was working on her algebraic answer, I was creating a dynamic version on GeoGebra. I built the area 20 triangle by first drawing a segment AB and measuring its length, a. That meant the height of this triangle, h, was given by . Then I constructed a perpendicular line to AB and used the “Segment with Fixed Length” tool and defined the length using the generic length of h as defined above to create segment AC. This worked because GeoGebra defined the length of AB as a variable as shown below. I used the “Compass” tool to create a circle with radius AC through the perpendicular line created earlier. Point D is the intersection of the circle and the normal line. I then constructed a perpendicular to AD through D and placed a random point E on this new line. Point E was the requisite height above AB to guarantee that always had area 20 which I confirmed by drawing the triangle and computing its area. I hid AC, the circle, and both normals. Segment AB was a completely independent object, and point E was free to move along the second “height” normal. I measured AE and repeated the previous construction to create the area 15 triangle. Because BE was part of a cevian, I drew line BE to determine point J on the normal defining the final vertex of the area 15 triangle. Again, I hid all of my constructions and repeated the process to create the final vertex, K, of the area 8 triangle off side BE of the area 20 triangle. Extending segments AJ and BK defined point L, the final vertex of the quadrilateral. Laying a quadrilateral in the figure let me compute its area. Moving points A, B, and E around the screen and seeing the areas remain fixed is pretty compelling evidence that the quadrilateral’s area is always 27, and Tatiana’s proof showed why. You can play with my final construction on GeoGebra Tube here. Then Tatiana emailed me a much shorter proof. Reversing the logic of her first solution, Tatiana reasoned that equivalent-altitude triangles had equal base and area ratios. 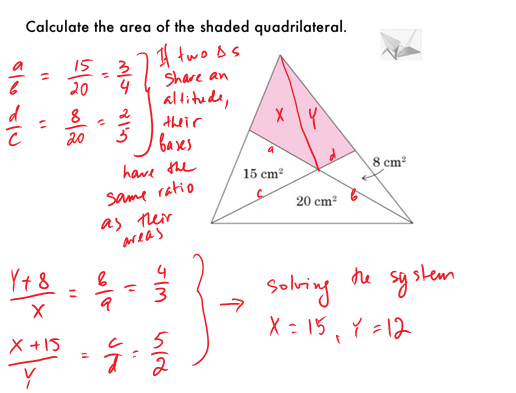 And the sum of X and Y gave the quadrilateral’s area. This problem was entertaining both in the solution and the multiple ways we found it. Creating the dynamic construction gave insights into the critical features of the problem. Here are some potential extensions I developed for this problem. I haven’t fully explored any of them yet, hoping some of my geometry students this year might take up the exploration challenge. I’d love to hear if any of my readers have any further suggestions. It might be interesting to create an even more dynamic construction with the areas of the three given triangles defined by sliders. Can the quadrilateral’s area be expressed as a closed-form function of the areas of the three given triangles. What happens on the boundaries of this problem? That is, what happens if one of the side triangles was a degenerate with area 0? What would happen to the quadrilateral? Would would be the corresponding affect on the area formula from extension 2? 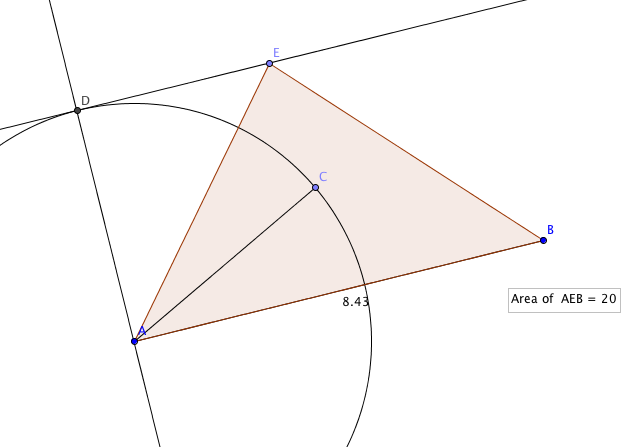 Extending 3 even further, if both given side triangles were degenerates with area 0, it seems that the area formula from extension 2 should collapse to the area of the final given non-zero triangle, but does it? Thanks again, Five Triangles, for another great problem! Quadrilateral surprise … or not? The first time I recall encountering this problem was about 10-15 years ago when I was reading David Wells’ Curious and Interesting Geometry. Not having taught geometry for several years, I’d forgotten about it until I encountered it again last week in Paul Lockhart’s Measurement. Draw any quadrilateral with non-intersecting sides. Place a point at the midpoint of each side. Connect the four midpoints in clockwise order. 1) What shape does the resulting quadrilateral always assume? 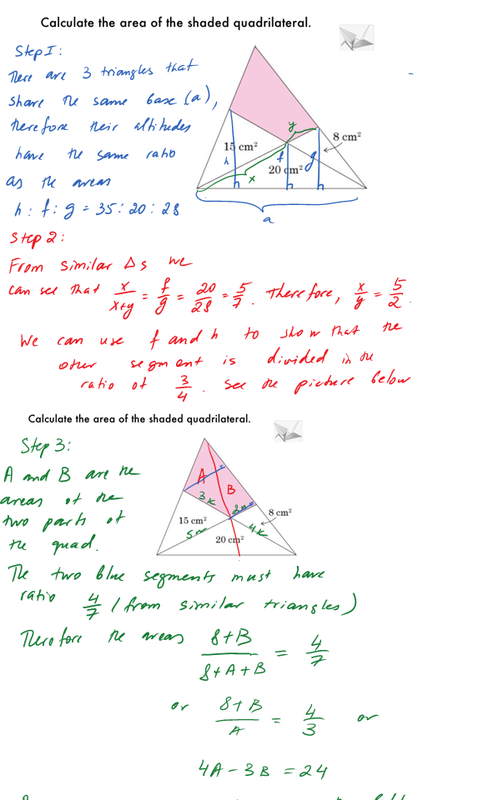 2) How does the area of the new quadrilateral compare to the area of the original quadrilateral? Of course, you need to prove thy claims. Draw several different quadrilaterals in your investigation. So long as the sides don’t overlap, nothing else matters. The pattern will emerge. I love the stunning and unexpected emergence of order. Don’t read any further until you’ve played with this for yourself. The joy of mathematical discovery is worth it! Above all, give yourself and your students lots of time to explore. Don’t be too quick to offer suggestions. PARTIAL SOLUTION ALERT! DON’T READ FURTHER UNTIL YOU’VE PLAYED WITH THE QUADRILATERAL PROBLEM ABOVE! I suggest using TI-nSpire, Geogebra, Geometer’s Sketchpad, or some other dynamic geometry software to model this. Using my TI, I was able to quickly explore an entire spectrum of results. Following are two representative images. No matter what type of non-overlapping quadrilateral you draw, a parallelogram always seems to emerge. I thought a while through various approaches to discover an elegant way to prove this, and in the process discovered the area solution. Find your own proof before reading further. FINAL SOLUTION ALERT! DON’T READ FURTHER UNTIL YOU HAVE YOUR OWN SOLUTION. My great insight happened when I imagined a diagonal drawn in a quadrilateral, splitting the original into two triangles. 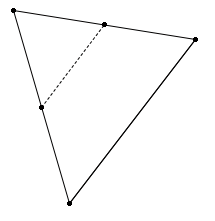 That insight reminded me of a cool triangle property: In any triangle, if you connect the midpoints of two sides, the resulting segment is parallel to and half the length of the third side. In any quadrilateral ABCD, let W, X, Y, and Z be the respective midpoints of segments AB, BC, CD, and AD. Draw diagonal AC of ABCD, creating triangles ABC and ACD. By the triangle property noted above, segments WX and ZY are each parallel to and half the length of WXYZ. That is sufficient to establish that WXYZ is a parallelogram. QED. To establish the area condition, I offer a proof without words. I’d love to hear how any of you approach the problem. I’ll post any responses.